On opening the box, I was impressed with the build quality of the system. The front toolrest was very smooth, polished and chrome plated, as were the roller bars in the torque arrestor assembly. All the aluminium parts - including the tool handle - were blue anodised. It was also nice to see all the Allen keys needed to set up and mount the system were included in the kit. The instruction manual was very clear and contained plenty of diagrams and colour photos. I also found some helpful video clips on the Carter Products website regarding the setting up and use of the system. I assembled the front toolpost with the longer stud supplied with the mounting stud - various studs are available to fit most lathes - and fitted it to the bed on my lathe. I then fitted the stud to the torque arrestor and mounted that on the banjo - following the advice to rotate the banjo so the assembly was in a better position for hollowing. steel equivalents. 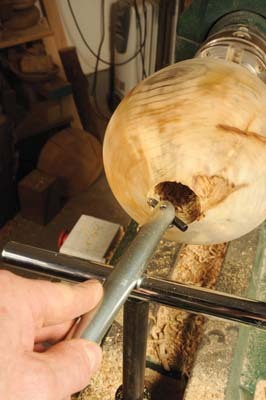 When cutting the side of the hole, wood was removed very easily and very quickly. There was no need to grip the tool to my side or to take care with presentation and rotation of the bit because all that was done for me by the system. Once the cutting height is set and the position of the cutter in the holder is fixed, the torque arrestor prevents the tool from rotating and from being pulled downwards inside the hole. 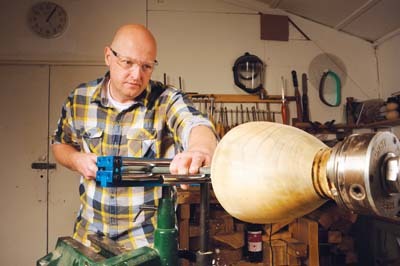 The whole hollowing process was now a very relaxed affair, all I had to do was to make sure I didn't go through the side. When I got to cutting across the bottom of the hole, I found I couldn't get a good cut with the Hunter tool. On closer inspection, it looked like the mounting shank was protruding slightly too far, preventing the cutter from engaging with the wood so I removed the cutter, ground the end of the mounting shank back so it wasn't getting in the way and went back to hollowing. With this small modification, the cutter performed without any further problems and cut across the bottom of the hole without difficulty. It was useful to be able to set the position of the banjo to use the torque arrestor as a depth stop to prevent me from hollowing too deep. This was simple to do and pretty much foolproof. My only difficulty with the system was the tendency for forward and backward movements into and out of the hole to require less effort than sideways movements because the roller bars are mounted on bearings. This made it slightly more difficult when trying to follow the undercut curve under the opening. That was probably compounded by me having to angle the tool across the roller bars instead of having it parallel to the bed. This was necessary to achieve the degree of undercut needed for the chosen shape. I switched to the high-speed steel scraper cutter to try that too and it also cut very well. One problem I found with both cutters was that due to their small size, it was difficult to achieve a smooth surface without ridges from the tool - which was partly made more difficult by the problem with forward/sideways movement described earlier. I found a larger scraper bit from another tool and used that for finishing. to makers of smaller hollow forms. Setting up for the first time is a little fiddly, but once you know how things go together it is simple thereafter. I found the system easy to use and love that you donâ€™t have to work at funny angles to hollow work. 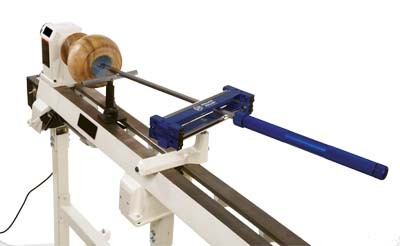 The system prevents the tool from lifting up during the cutting process allowing the turner to concentrate on the shape more than worrying about other aspects of tool control. 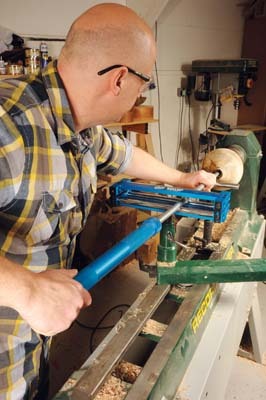 It's supplied with a basic set up of tooling but, you can use your own cranked swan-necks and other tools, as you need them. 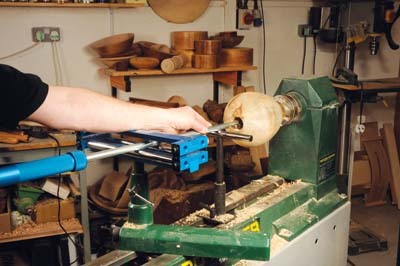 The handle has a specific shaft size; all you would need is a collet to suit your tooling and all will fit well. Then adjust the height of the rollers to suit the new shaft size and off you go. I like it a lot.